I was well educated in learning how to be a good teacher in college. So, I was reasonably confident in my ability to succeed at homeschooling…..even though I was the only person I knew that home-schooled. I basically duplicated the public school classroom in my home. It didn’t take long for me to figure out that something was missing. First of all, the home and public school are two totally different entities. Second, TU didn’t teach me how to school a kindergardener with a baby and toddler under foot. Also, They don’t hand out degrees for learning how to love your husband and train your children in the fear and admonition of the Lord. For years I stumbled my way through schooling, my marriage, my walk with the Lord….. Not that I have arrived, but I sure am not where I used to be. I found myself in an endless cycle of competition with other moms in the race for teaching knowledge. For example, if I knew someone whose 6 year old could name all the Presidents, then I would go home and drill my 6 year old until he knew them too. If I knew someone’s child who could read at 4 or 5, then I would have endless reading lessons with my 4/5 year old …… Which, by he way, only led to much frustration because my kids were unable to do so at that age. You see the Bible speaks of two different types of wisdom: the wisdom of the world, which is foolishness in God’s POV, and then the Wisdom of God… Which is foolishness in the worlds POV. I was seeking the world’s version of wisdom. In our culture, education is everything! Why? Well, the end result of why our culture deems education so valuable is really the love of money. If you have a good education, then you will get a good job, then you will have a good paycheck and be secure as you live happily ever after. But. The Bible tells us to seek wisdom above all other values, even if it costs us everything! In my own life, I began to hear the call of Wisdom crying out to me. I began to see my desperate need for her, in my life which included my homeschooling. I was tired of putting my hope for my kids to have a secure future in and through education…… Not that education isn’t important or valued by God, but There was a Holy dissatisfaction within me for putting my trust in it. I read in the Bible how God took a simple young man, Solomon, and crowned him with wisdom. I desired it for myself and I saw that the Lord would grant it to me and anyone else if they simply asked. The Lord used the HOW teaching approach as a launching pad in setting my homeschooling upon a solid foundation. I discovered that True wisdom is the ability to judge correctly and to follow the best course of action based on knowledge and understanding. This is impossible apart from studying Gods Word. The fruit of wisdom is one and the same as the fruit of the Spirit: love, joy, peace, patience, kindness, goodness, faithfulness, gentleness, and self-control. The primary purpose of education is to train the whole person for lifelong faithful service in the knowledge of God. Christ is our Wisdom, if our children do not know Him, then they can’t have wisdom. What’s the purpose of learning correct grammar if one doesn’t ever learn how to bridle their tongue or understand that the power of life and death is in the tongue? What’s the purpose of problem solving if your child doesn’t learn that he can do all things through Christ Jesus and to do them for Gods glory? Why teach them how to calculate percentages and tithe, if they don’t understand that obedience is better than sacrifice? 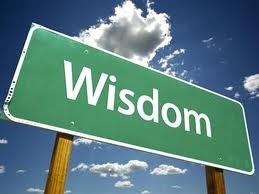 When God’s wisdom rules your schooling, education comes to life. History- instead of being a bunch of historical facts to memorize, it is the workshop of God, it’s significant bc it’s the story of people, people He created, how they came into being, what they did. Science- instead of learning about the existence of the universe, becomes an orderly study of Gods creation. God created the heavens and earth to receive and reflect back the glory and honor due him….. All scientific elements shout out praises to the God who made them. I remember the day like it was yesterday….. The day we Said yes to Wisdom….. It was as if we Circumcised our schooling by cutting off the worlds ways of wisdom. We truly set apart our schooling to be holy unto God. I put the fine China on our table and made a feast for our family. I created individual invitations in calligraphy for each of my children, rolled up like a fancy scrolls inviting them to wisdoms table. I explained to the kids that from now on, we were giving our schooling to the Lord and seeking wisdom above all else. Like I said earlier, anyone that knows me, can tell you that I had not arrived…. I still have much to learn, but now my confidence is in the Lord alone and nothing else. If you are interested in the curriculum that God used to launch me onto the path of wisdom in my homeschooling, click the link below.